KA: I heard about the series through a contact at the Spike and Mike's Festival of Animation. I gave 'em a call and well, the rest is history. KA: We only did the CGI portion of the opening theme...and what a terrific theme it was! KA: No. Concurrently we were producing an ABC Christmas special entitled Santa vs. the Snowman. We were pretty busy for a small animation company. We started working in CGI around 1993. ATY: And that would be after how long working with traditional cel animation? KA: DNA started as a company in 1987. 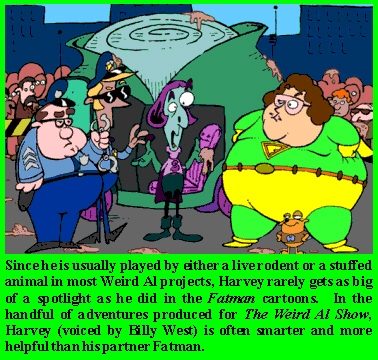 ATY: In addition to the CGI sequence, you also produced the Fatman series of cartoons for the show. How involved were you and your team with developing those segments before they were animated? KA: Very. We had a tiny crew working on the episodes...five people. I designed all the characters and provided all the key drawings, Paul Claerhout fashioned all the storyboards and did all the in-betweening, and Nick Gibbons did all the digital painting along with Tim Hatcher. We all worked in the inking department. John Roman did all the sound design and I wrapped it up with the final posting. ATY: Only five people?? That's pretty impressive for a series of animated shorts. KA: For the fifth episode we farmed out some work to an outside animator, but we did almost everything ourselves. ATY: Well, we'll let you go now so you can keep earning award nominations. Thank you so much for taking some time out to chat with us and to help our little cause! Images courtesy of DNA Productions. Be sure to check out their official web site! Here are a few of the studio's other works available on home video! 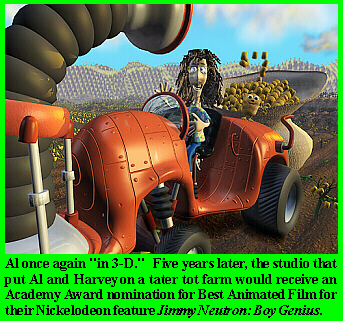 The Academy Award-nominated film that spawned the latest Nickelodeon sensation this side of a sea sponge! Drew Barrymore and Matt Groening co-produce this Emmy Award-nominated holiday special featuring the voices of Tim Meadows, Ed Asner, Jay Mohr, and Michael Stipe! A compilation including Keith's 1996 greatest-hits album commercial spoof Beat the Meatles!